Each personalized notebook favor measures 3 1/4 by 4 1/4 inches with a cover designed to display your personalized label. 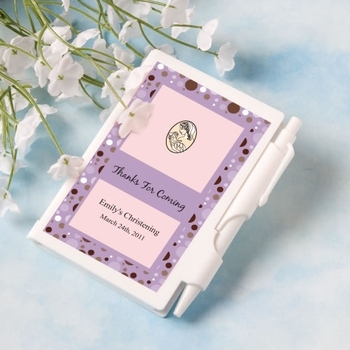 You can customize the labels with your choice of graphic designs, colors and text to commemorate your Baptism, Christening or other religious event. Inside each notebook you will find a blank white notepad with a convenient white pen attached. Choose from many design options to match your occasion, add your own name, date, and message. Personalized labels are self-sticking for easy application. Note - Assembly required: You apply stickers to each notebook. Certain to be a useful and unique memento of your special event, these favors come bulk packaged.